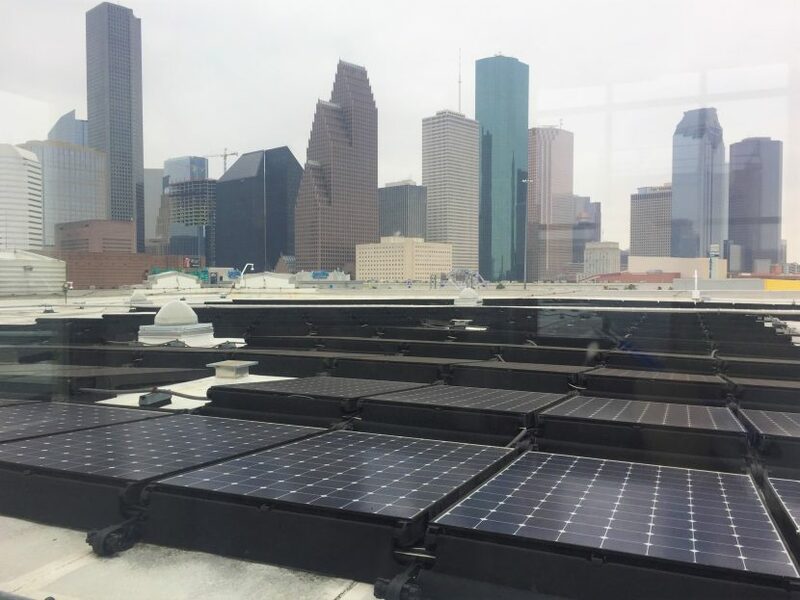 The Houston Permitting and Green Building Resource Centers are housed within a certified LEED Gold building, which incorporates a large variety of sustainable and low-impact features. Its roof not only supports this large solar installation, but is designed to follow a ‘cool roof code’, as mandated for commercial buildings by the city. The code serves to reduce buildings’ contributions to the heat island effect (a localized increase in temperature around urban areas, created by their everyday activities). This roof utilizes solar panels (which also act as additional barriers between the sun’s rays and the roof, helping to keep the building cool), as well as exhibiting a light-colored and more reflective roof material, and vegetated green roof on the building’s side. These features give the roof a very high solar reflective index (SRI) of 89/100.